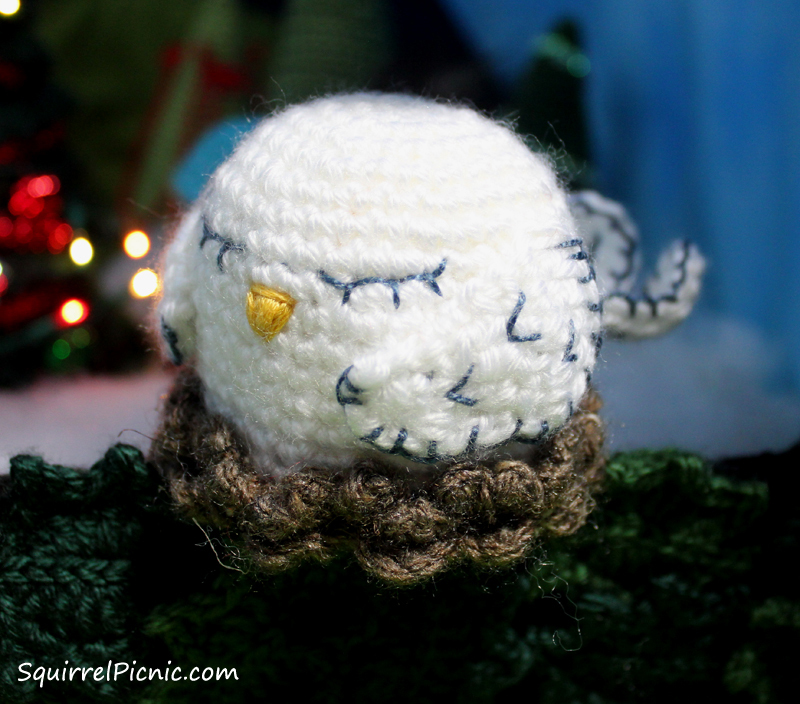 Squirrel Picnic’s 2014 Winter Holiday Banner Is Here! The 2014 winter holiday banner shows Hodge and Podge getting in the spirit of the season. 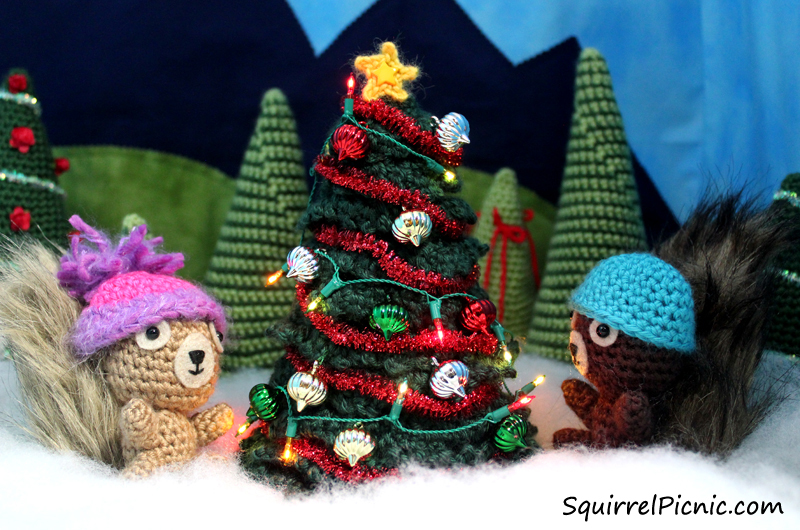 After making snowsquirrels and wrapping them up with scarves they crocheted, our two favorite squirrel friends decorated a Christmas tree, complete with miniature Christmas lights! They did this all very quietly, so they wouldn’t wake the dove sleeping nearby. This diorama took me about two months to complete. First I created the form for the holly wreath by crocheting two frames in black and sewing them together around a cardboard form. This gave it stability while also providing a surface that I knew would be easy to attach my crochet holly and poinsettias to. 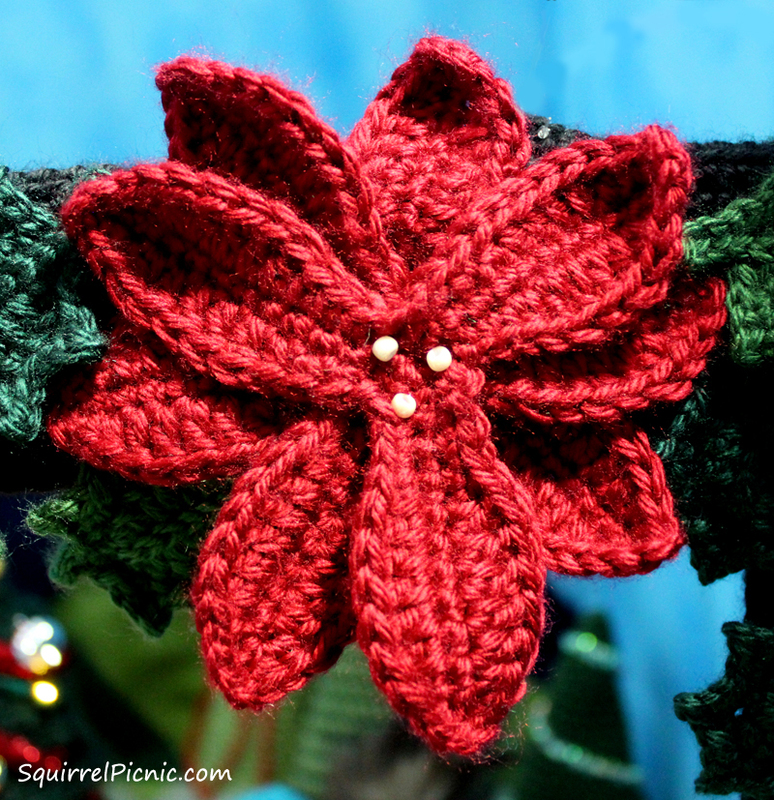 The holly pattern by Lucy of Attic 24 is very easy to do and it creates an elegant holly leaf. I love the slip-stitched vein down the center. Like most of her patterns (which are also amazing! ), this one includes a photo tutorial to help walk you through the instructions. 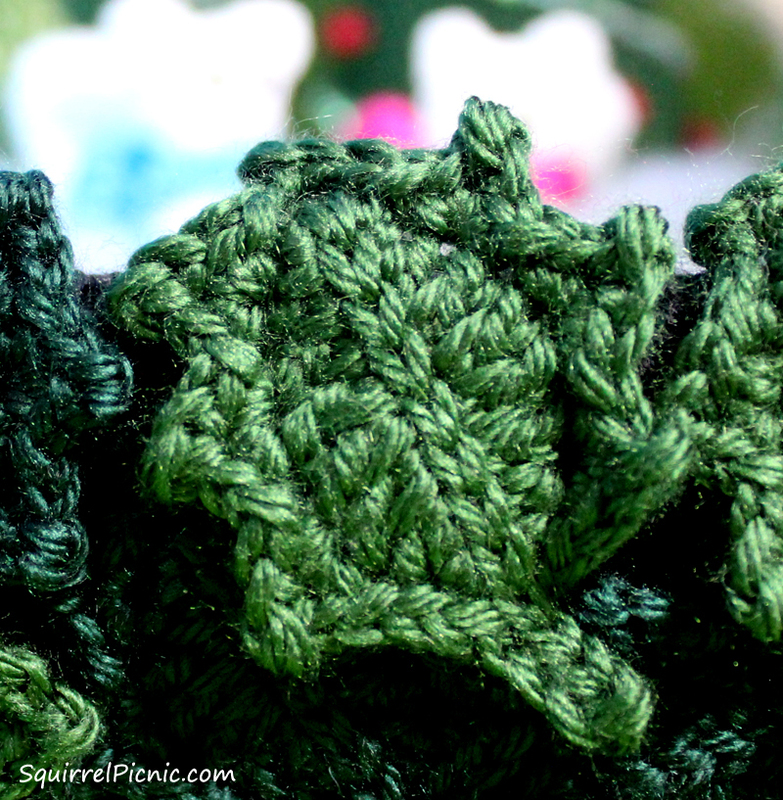 For these holly leaves, I used Caron Simply Soft in Forest Floor and Dark Sage. The poinsettias were made using a pattern from Joanne Loh. You crochet three separate layers, stack and sew them together, and embellish them with seed beads. Aren’t they neat? Her pattern calls for lace thread, but I wanted to make them significantly larger so I used a light worsted-weight yarn (Caron Simply Soft in Autumn Red) and a G-6 (4.00 mm) crochet hook. 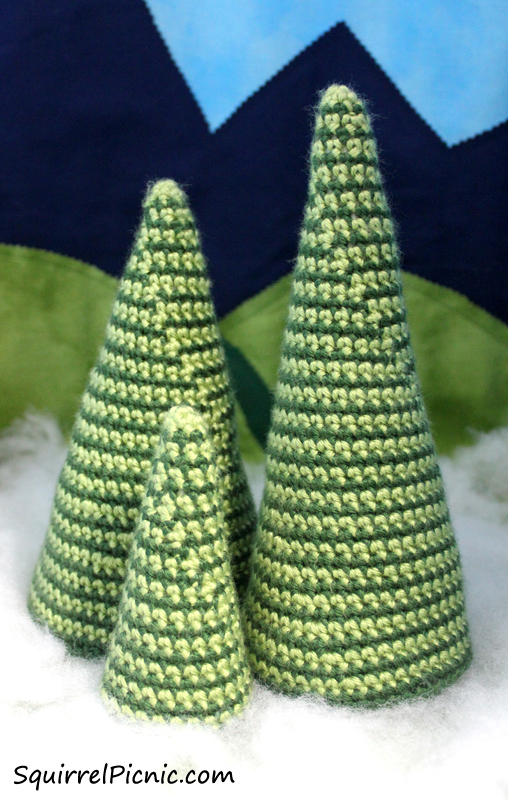 Next I crocheted the Christmas tree using a pattern by Helen Free. This pattern was a lot of fun to do. It is worked in turned rows to create layers of ruffles that look more like an evergreen than any of the other patterns I tried. In case you’re wondering, I used Caron Simply Soft in Pine for this tree. I found Helen’s pattern to be clear and thorough and it produces a tree that will look great at the center of your own holiday display. The trees in the background were made using this pattern by Kara Gunza of Petals to Picots. They are really simple and quick to whip up. She suggests using Styrofoam cones in the center to give them form. I just filled them with polyester stuffing and sewed a crochet circle onto the bottom, but I think you should follow her method as it will provide better support and shape. And last but not least, that darling little bird was made from the Roosting Bird pattern by Irene Strange. The pattern includes crochet instructions for the body, tail, and wings, as well as assembly and embroidery. It all comes in a very lovely PDF (free Ravelry download) that I know you will enjoy. Some of you may recognize the snowsquirrels from last year. What can I say? Hodge and Podge just love making them! To make snowsquirrels, use this snowman pattern by The Dapper Toad. To make a snowman into a snowsquirrel, you’ll need a tail and ears too. For the tail, make another snowman but replace “Rows 11-13: sc around” with “Rows 11-15: sc around.” Then continue pattern as written. Stuff lightly. As you’re stuffing the tail, rework the shape by flattening the bottom and rounding the top. Sew the tail to the back of your snowsquirrel. Make 2 ears from my squirrel pattern and attach to the top of the snowsquirrel’s head. 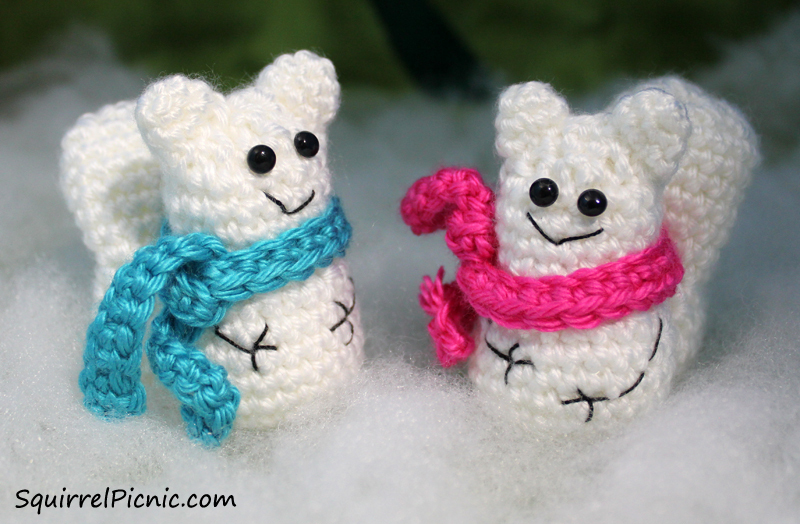 I also used The Dapper Toad’s pattern for the snowsquirrels’ scarves. Before I go, I want to tell you a secret. Did you know that if you follow me on Ravelry and Instagram, you can watch my progress and see projects like these take shape? So join me. I’m always happy to make new friends and I look forward to seeing you around! I hope that the new banner brings you a bit of holiday cheer and a smile and that you enjoy using the free crochet patterns from some of my favorite designers to make your own home as festive as can be. Categories: Banner Dioramas, Crochet It, Hodge & Podge | Tags: bird, Christmas, crafts, crochet, diorama, diy, holiday, holly, poinsettia, squirrel, tree, winter | Permalink. you did a great job. thats alot of work. i love all your sayings you post. thank you for shareing you beautiful wouk. love the snow squirrels. That is beyond adorable and beautiful in the detail. Amazing work! I had so much fun reading this post! I love your work and this time it is something special. I can see how much work and love you put into this and it turned out to be great. Thank you and all the other designers for sharing those beautiful patterns! Thanks, Karin! I’m really glad you enjoyed reading about all the patterns I used. This diorama was a lot of fun to make and it means so much to me that others are enjoying it too. Oh my gosh I didn’t know there was a blog on the cutest thing ever! Magical! Love what you have done with my Christmas tree and thanks for the lovely comments. Thanks, Helen! And thank you for stopping by to check it out. Your Christmas tree is spectacular and it was so much fun to make. How adorable is your banner!! All the little things you made are so cute!! This has definitely put me in the Christmas spirit. You are so creative and have a wonderful imagination. Thank you for providing so much inspiration! Thanks, Patricia! I am so glad that you have enjoyed it and that it added a bit of festivity to your day. And thank you, as always, for your kind words. You are so sweet! Jennifer, it is beautiful! Love it! Thanks, Vanja! It was a lot of fun to put together. Gorgeous!! Hodge and Podge are so very lucky to have you. Yay! Sharon! I’m so glad you like it. And you’re right Attic 24 deserves a big award! They all do really. Everything about this is so adorable! I love the snowsquirrels… I need to teach my guys how to build some of those. I don’t know why I didn’t think of that last winter! I may have to try that this year… with one of my tasty corn cobs stuck in the face! Woohoo! I can’t wait to see this!